In a recent drive from Texas to Arizona, billboards along Interstate 10 West beckoned my husband and I to explore “The Thing?” roadside curiosity. As it turned out, the best part of our stop at the travel center was ordering ice cream from Dairy Queen. The creamy treat in an edible handhold is quintessential summer. One can lick, lick, lick away, and then, consume what remains. The simple cone is easily taken for granted, but after touring the Joy Cone factory in Flagstaff, I knew exactly from where the flaky cup in my hand had been shaped, baked, packaged and shipped. 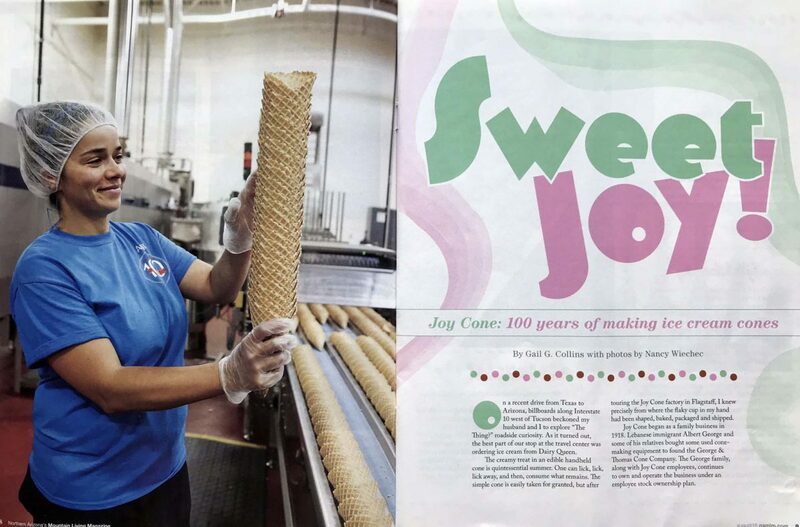 Joy Cone began as a family business in 1918. Lebanese immigrant George Albert and some of his relatives bought cone-making equipment to found the George & Thomas Cone Company. The George family, along with Joy Cone employees, continues to own and operate the business under an employee stock ownership plan. Although ice cream cones were sold by street vendors in New York in the 1890s, they achieved popularity in 1904 with its introduction at the World’s Fair in St. Louis. The stories are many, but the according to the International Dairy Foods Association, Syrian immigrant Ernest A. Hamwi, is the inventor of the conventional ice cream cone. Hamwi, a pastry vendor, was selling “zalabia,” a crisp, sugary waffle, near the many rows of ice cream hawkers at the fair. He rolled the waffle into a cone, handed it to be filled with ice cream, and the rest is sweet history.